In 1790, the year of the first U.S. Census, the population of the territory which is now West Virginia was 55,873. The nation’s population in that first census was 3,929,214. West Virginia’s population grew from 1790 until the 1950s, peaking according to the 1950 Census at 2,005,552. According to the 2010 Census, there were 1,852,994 West Virginia residents, compared to 309 million residents for the United States as a whole. West Virginia’s share of the U.S. population has fallen from 1.4 percent in 1790 to 0.6 percent in 2010. This implies that the state’s population growth has fallen well short of national growth during the last 210 years. This is true in general but not true for every part of that long period of time. From 1900 to 1950, West Virginia’s population growth exceeded national growth, as the expansion of the state’s mining and manufacturing industries boosted economic growth. However, the strong population gains registered during the first half of the 20th century were not repeated during the last half, nor in the early years of the 21st century. After reaching a high of just over two million in 1950, the number of West Virginians has risen and fallen with the state’s economy but fallen on balance. With increasing mechanization in the coal mines and good economic opportunities in other parts of the country, the West Virginia population dropped by 261,000 residents from 1950 to 1970. The energy crises of the 1970s brought a resurgence in coal mining, which contributed to a rebound in the state’s population to near the 1950 level by the end of the decade. Unfortunately, a global recession during the 1980s, coupled with economic restructuring in the state’s major manufacturing and coal mining sectors, pushed the number of residents down to 1,793,477 by 1990. West Virginia’s population rose by 3.3 percent from 1990 to 2010, a growth rate well below the national rate of 24.1 percent. It increased to 1,856,313 by 2012; however, West Virginia lost residents over the next two years, with the number decreasing to 1,850,326 by July 1, 2014. 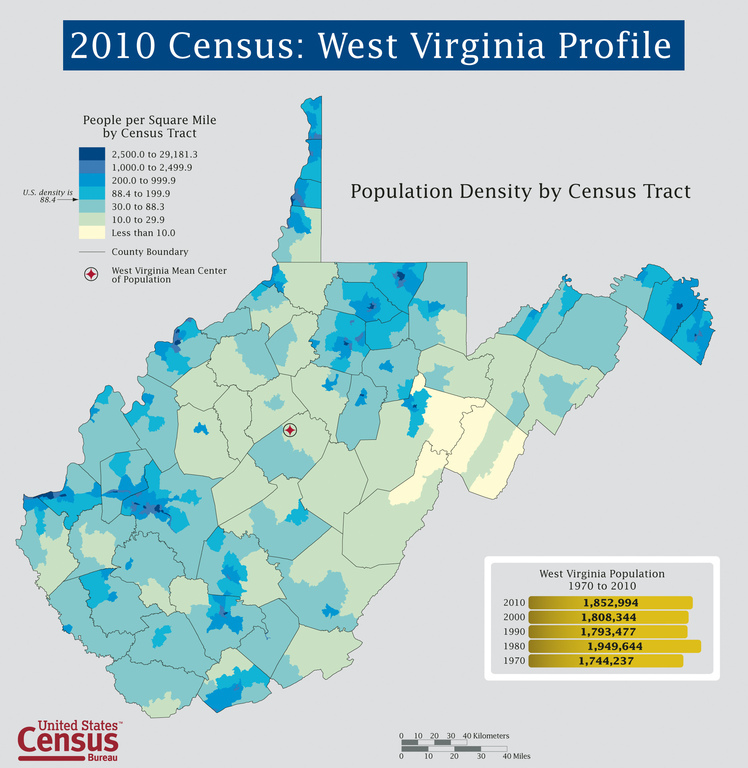 The reasons behind the recent stagnation in West Virginia population growth are related to the state’s demographic structure. Population change depends primarily on two factors: natural increase and net migration. Natural increase is the annual difference between births and deaths. Since the state’s number of births during the past two decades was very close to its number of deaths, West Virginia’s population got little boost from natural increase. This means that state population growth was dependent on net migration, which is the difference between the number of residents moving into the state and the number leaving the state. Due to the state’s sluggish economic growth, West Virginia had trouble attracting more migrants than it lost to other states and in some years net migration was negative. West Virginia’s population levels have always differed significantly in the various counties. In 1900, Kanawha County, with the largest population in the state, had 54,696 residents, compared to Hancock County with 6,693 residents. However, during the last 100 years the population gap between larger and smaller counties has risen dramatically. The largest county in 2010 was again Kanawha County, with 193,063 residents, compared to Wirt County with 5,717 residents. County population growth tends to follow regional economic performance. None of the major southern coal-producing counties, Boone, Logan, McDowell, Mingo, or Raleigh, ranked in the top 10 in population size in 1900. With the expansion of the coal industry during the first half of the century, McDowell, Raleigh, and Logan counties all ranked in the top 10 in population in 1950. But due to changes in the coal industry and the lack of diversification in these counties’ economies, only Raleigh remained in the top 10 counties in 2010. The experience of McDowell County provides a dramatic illustration of the changing fortunes of the coal industry on population size. In 1900, the Census Bureau counted 18,747 residents in McDowell County. By 1950 that number swelled to 98,887 residents, while the 2010 Census found just 22,113 McDowell residents, a decline of 19.1 percent from 2000. Overall population growth during the post-World War II period has favored counties with larger cities and the ‘‘bedroom’’ counties from which cities draw commuters. By far the fastest growing parts of the state during the last 50 years were three counties in the Eastern Panhandle (Morgan, Berkeley, and Jefferson) and Putnam County. These four counties have benefited from the expansion of nearby metropolitan areas. Berkeley and Jefferson are now classified as part of the Washington Primary Metropolitan Statistical Area, while Putnam County is now part of the Charleston Metropolitan Statistical Area. Counties registering the largest population losses during the last 50 years were the coal-dependent counties, particularly in the southern part of the state, and the manufacturing counties in the Northern Panhandle. Population change has also had an impact on West Virginia’s cities. In 1900, the largest city in the state was Wheeling, with a population of 38,878, followed by Huntington, Parkersburg, Charleston, and Martinsburg. By 2010, the top five cities were Charleston, with 51,400 residents, Huntington, Parkersburg, Morgantown, and Wheeling. In addition, during the last 10 years, West Virginia’s incorporated places collectively have lost population, in contrast to population gains registered by the state’s unincorporated areas. West Virginia remains a rural state with mostly small cities. That is increasingly unusual. In 1900, 86.9 percent of West Virginians lived in sparsely populated rural areas. That compared to 60.4 percent nationally, but 10 other states in 1900 had larger shares of residents living in rural areas. By 2010, only two other states (Maine and Vermont) were more rural than West Virginia. Most states saw their residents concentrate in urban areas during the 20th century. West Virginia did not participate in this trend, and a large share of residents continue to live in rural areas today. Hammond, George W. "Population." e-WV: The West Virginia Encyclopedia. 17 August 2017. Web. 25 April 2019.